You are here: Home › Holidays › St.Patricks Day With The Irish Fairy Door! GIVEAWAY! The Irish Fairy door is a magical portal to connect with fairies. We are celebrating St.Patricks Day with TheIrishFairyDoorCompany in our family. We are so excited to share The Irish Fairy Door with our girls this year for this very special holiday. 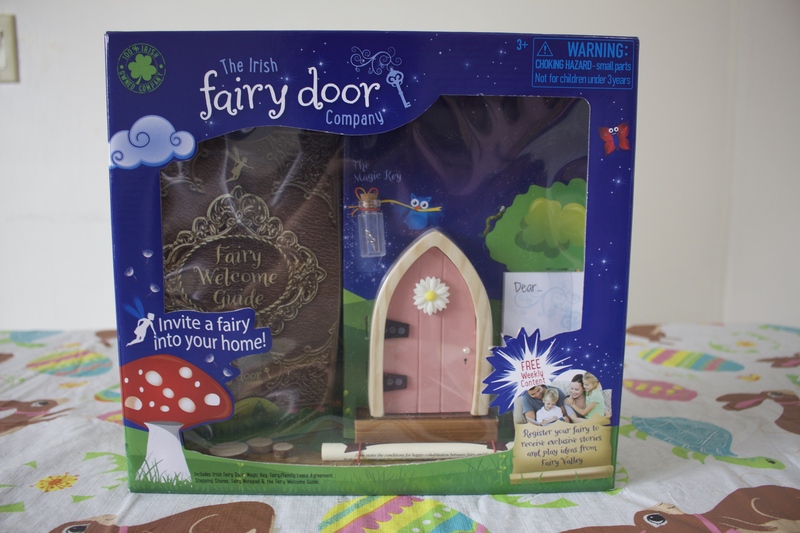 Each Irish fairy door comes with a magic key in a bottle, three stepping stones, the Fairy / Family Lease agreement, a fairy notepad to write little notes to your fairy and the Fairy Welcome Guide, which outlines all that you need to know settle your fairy into their new home! The Irish fairy door is available in pink, blue, purple, green and red. The MRSP is $24.99. How Does the Fairy Door Work? The Fairy door company explains the process in three easy steps, they are simple for your child and yourself. Pick a special places to put your fairy door and stepping stones and leave the magic key beside it. If the magic key is gone in the morning, your fairy has arrived! Register your fairy’s name and unlock a world of imagination of fairy valley. Here is a great video explaining and introducing The Irish Fairy door. Seeing children’s faces light up this way brings a smile to my face. Growing up I never believed in Magic, Fairies or Santa my parents were just not into it. I always wanted to raise my children in a way where they can have a fun childhood were they can have an imagination, and believe the impossible. I know the Fairy door and Fairies are going to bring so much joy into our home.